Chen Fuchao, a man heavily in debt, had been contemplating suicide on a bridge in southern China for hours when a passer-by came up, shook his hand - and pushed him off the ledge. Chen fell 26 feet onto a partially inflated emergency air cushion laid out by authorities and survived, suffering spine and elbow injuries, the official Xinhua News Agency said Saturday. The passer-by, 66-year-old Lai Jiansheng, had been fed up with what he called Chen's "selfish activity," Xinhua said. Traffic around the Haizhu bridge in the city of Guangzhou had been backed up for five hours and police had cordoned off the area. "I pushed him off because jumpers like Chen are very selfish. 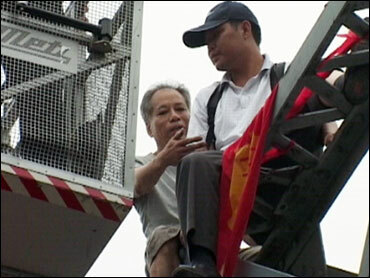 Their action violates a lot of public interest," Lai was quoted as saying by Xinhua. "They do not really dare to kill themselves. Instead, they just want to raise the relevant government authorities' attention to their appeals." Xinhua said Lai was "taken away by police" but did not elaborate. According to Xinhua, Chen wanted to kill himself because he had accrued 2 million yuan ($290,000) in debt from a failed construction project. On Thursday, he made his way to the Haizhu bridge, where 11 other people have tried to take their lives since April. Lai volunteered to talk Chen down but was turned away by police, Xinhua said. Lai then broke through the cordon, climbed to where Chen sat, greeted him with a handshake, then pushed. The paper said Lai was released on bail Friday but did not give any details. It said he had been on medication for "a mental illness" for decades and had been on his way to a hospital for his pills. Chen was recovering in the hospital, Xinhua said.